"Sea Monkey" Oceanfront Beach Cottage 4 Bedrooms, 2.5 Baths, Sleeps 9. Fully equipped kitchen with dishwasher and microwave. Washer/Dryer. Cable TV in every bedroom and the main room of the home. Also 3 DVDs. Wifi. Phone. Ceiling fans in all bedrooms and main area of the home. Relax on the covered porch. Charcoal grill. Hot & cold shower located on private walkway to the beach. Enclosed shower ground level. Non-smoking. Bedding: King, Queen, King, Queen/Single. All bed linens and bath towel sets will be provided for the unit. Dock Rental available for additional weekly fee of $150. Inquire as to availability. 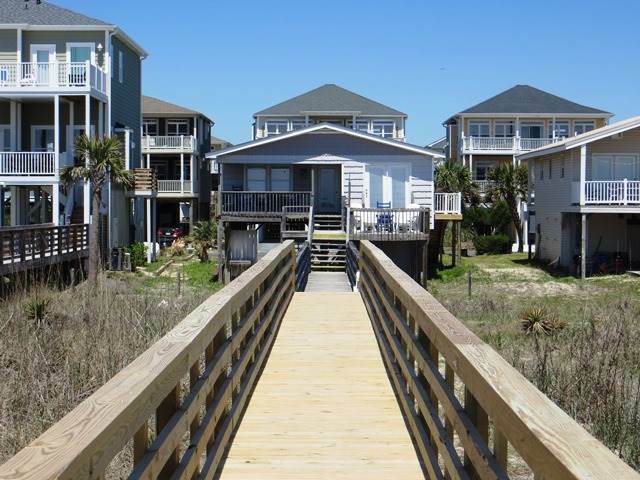 NO dock rentals after 3rd wk in Aug.
Our family has been coming to OIB for over 30 years and we have stayed at many houses on the front row- this is our absolute favorite. The porches are wonderful- the family area is cozy. We had a wonderful time- thank you Sea Monkey!! Hope to be there again!!! !